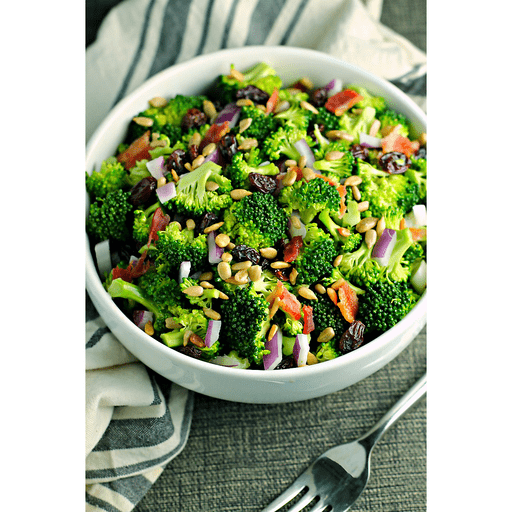 There’s something about the refreshing crunch of broccoli mixed with a slight, red onion-bite and naturally-sweet raisins that just works so well. This lightened-up version has less sugar and fat than more traditional recipes and it’s a great way to get in a serving (or two) of fruits and veggies. Pair this nutrition-packed salad with a holiday ham, or serve it this summer with a grilled turkey burger and fries. 1. In a small bowl, whisk together olive oil, red wine vinegar, mayonnaise and sugar until smooth. 1. Place broccoli florets, diced onion, raisins, sunflower seeds and bacon crumbles into a large mixing bowl. Add dressing and toss to mix. Serve chilled. Try substituting 1½ cup halved red grapes for the raisins. Calories 160, Total Fat 11g (Saturated 1.5g, Trans 0g), Cholesterol 5mg, Sodium 75mg, Total Carbohydrate 14g (Dietary Fiber 2g, Sugars 9g), Protein 3g, Vitamin A 15%, Vitamin C 40%, Calcium 2%, Iron 4% *Nutritional values are an approximation. Actual nutritional values may vary due to preparation techniques, variations related to suppliers, regional and seasonal differences, or rounding.